On the PTR you’re randomly awarded level 25 pets as you churn battles. I started getting them after I had a level 6+ pet, and I’d already beaten the little girl in Redridge. The next time I logged on, boom, 25s. Beyond that I’m not too sure, but this was on a copy of my Live toon. No intact achievements or pets, but I was able to pick up the Tamer quests all the way down, even though I hadn’t technically been able to beat them yet. It’s a little weird. If you’re trying to see for yourself, just buy a cat and start cascading your way on up. Anyway. 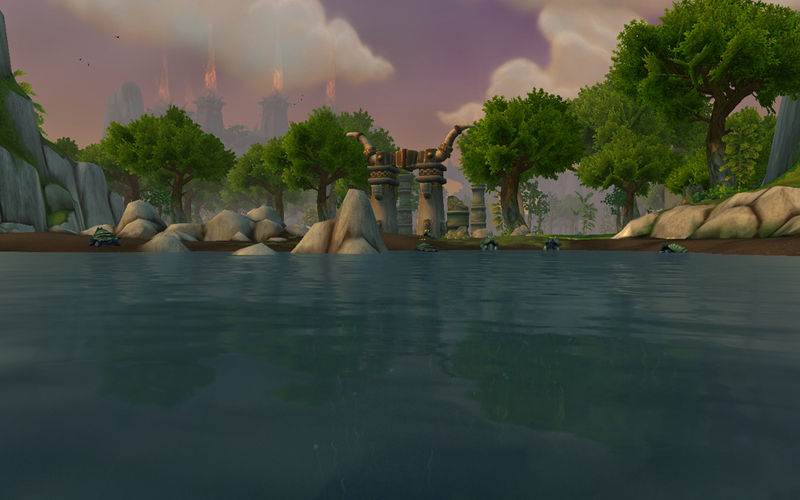 As of last post I’d been awarded Niuzao and Yu’lon, but it was pretty clear that they were still being worked on, as their moves were all identical, and they were scaled to be ridiculously huge. Now, all 4 have unique, individual moves, and the pets themselves are much smaller. First, we’ll look at Yu’la, Broodling of Yulon, who is the pet I’m suddenly most excited for. The Celestial Blessing ability looks to be a soft counter for Force Swap. I’m not sure about her other abilities in terms of actual PVP viability though… she seems very one note, but what a note. Zao, Calfling of Niuzao looks like a lot of fun to play. As noted in the video, in addition to being relentlessly cool, Zao also has a bunch of really useful abilities. He has Wish, which automatically makes him an excellent pick in PVP or PVE. You could cast Wish, and then back it up with your Niuzao’s Charge and reduce a lot of the risk from your down time. He honestly seems a little overpowered right now, but this is PTR after all, so we’ll see how things shake out. We still don’t have even the slightest idea of how these pets will be earned, so his OP-ness might be a reflection of how hard he is to get. We’ll see. I still don’t have either of the last 2 pets, so I can’t show them in action, but they also have new & improved ability movesets. Chi-Chi shares a name with the worst Mexican franchise I’ve ever eaten at. The pet looks to be far less terrible, with a mix of bird-style abilities. He has an elemental variation on the typical flying Quill. He gets a regular old Alpha Strike, and Wild Winds on the Flying side. He has Feign Death and Tranquility, and an ability like the the Anubisath Idol’s Deflection. I’m not sure where he’s going to fit in just yet. The defensive stuff is intriguing, but this seems to be a really odd, scattershot set of abilities to me just now. Xu-fu, Cub of Xuen, looks like he’s going to be a tiny ball of teeth and biting teeth with teeth and blue fur. It looks like there are 2 ways you can go with him. Either you can pair the new Spirit Claws, which hits relatively hard but has low accuracy, with Moonfire (yes, the cat can moonfire. you know, somehow), which increases Spirit Claws’ accuracy to 100%. Or, you can pick the not quite so hard hitting Bite, and pair that with the Absorb-like Feed, which heals you for your damage done. The third slot features either Prowl, which may give the first choice a big edge, or Vengeance, which is very new, and hits your opponent for the last damage you took. This may be a good pick as a counter pet to those buffed hard hitters like, oh, I don’t know, the upcoming Zao! Can you tell I’m really, really excited for the tournament to get here already? edit – of course, right after publishing this post, I got both xufu and chichi. This entry was posted in Uncategorized and tagged 5.4, celestial tournament on July 13, 2013 by Liopleurodon. – Death Grip, Nether Gate, Sweep get the NERFBAT(tm). Thank goodness. I’m just about tired of Fiendish Imps. PvP Sidenote: The CWG/Scourgeling/Fel Flame team is still going strong, ~75% win percentage. I also _finally_ just got a Humanoid stone so I’ll be setting up my Moonlight/Mushroom team this week – just have to level the Sporeling now. I haven’t really seen the family changes yet, because I’m pretty much just churning lower level battles in order to make sure I can get on the Isle ASAP, heh. It looks like they’re trying to walk the line between making force swap the best ever amazing and a viable strategy. Honestly I think were it not such a *thing* it would still be a deadly strategy for PVP because it basically makes you opponent re-evaluate their strategy, or at least lose a turn while they re-shuffle. I’m kinda iffy on the usefulness of the Yu’la counter, but hey. Looking at Xu-fu, you may want to leave a slot on your Moonlight team for him. He looks super, super sick and has Moonlight synergy. And I’m so glad you’re having success at PVP, yay! *shrug* It’s not like “force swap” itself is a broken strategy. The problem is that if the swap goes first it’s also (effectively) a stun. If the opponent would still do the current turn’s move from the back row or the Nether Gate always went last it wouldn’t even be an issue. 500 free damage is broken though. Compare to the Kun-Lai Runt. With the runt you also get a hard-hit+stun move that (almost always) goes first, but Nether Gate is even better than that because you don’t have to “waste” a turn with the (sub-par damage) Frost Shock first.